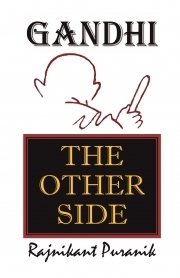 Description of "GANDHI : THE OTHER SIDE"
There is an ocean of books eulogising Gandhi. This book has consciously chosen not to be yet another drop in that ocean. This is also not a ‘balanced’ book. It does not attempt to offset good with the bad, or vice versa. This book looks hard, but only at the other side. “Truth stands, even if there be no public support. It is self-sustained,” said the ‘Apostle of Truth’ Gandhi; and this book looks hard at the truth about Gandhi. This book brings out the fact that most of the Gandhian thoughts and ideas were regressive, backward, irrational, illogical, impractical, and products of faulty comprehension. They were founded on very limited study, and on stubborn egoism born out of ‘I know best’. No wonder the ‘Mahatma’ has no legacy worth the name! Most of his ideas were discarded soon after his death—actually, much before his death: from 1944 onwards he stood sidelined. His only visible relevance that we see today is in ‘Swachh Bharat’. True, he advocated cleanliness, but then millions too have been advocating it! Most likely, without Gandhi India would have won its freedom, or at least self-government, many years before 1947. Apart from the history of India’s freedom struggle, and Gandhi’s role in it, this book brings out Gandhi’s detailed biography, his beliefs, and the principal aspects of his character and personality. Rajnikant Puranik has been a physicist, a banker, and a software professional, and has headed Information Technology division in several organisations. He has till date authored two technical (software) books, one novel, and seven non-fiction works. He studied at the Indian Institute of Technology (IIT) Kharagpur and IIT-Kanpur, and was a National Science Talent Scholar. Reviews of "GANDHI : THE OTHER SIDE"